Aerial shot of a maxi-barge with water tanks and shoreline workers hot-water washing a beach in Prince William Sound. (Exxon Valdez Oil Spill Trustee Council). The ultimate goal for the NOAA Prince William Sound Monitoring Program has always been to improve the way we respond to oil spills in a complex environment like Alaska's Prince William Sound. Our goal is to use science to better understand physical and biological recovery and then apply the lessons to spill response. The insights we gain relate to both the process of environmental monitoring itself and impacts caused by the spill and cleanup. So, what have we learned? First, it is difficult to assess the impacts from a disturbance—even a major one like the Exxon Valdez spill—in a dynamic system like Prince William Sound. The inherently high degree of natural variability found in such systems can limit or preclude the use of standard or traditional statistical methods. So-called "set-aside sites," areas that were oiled but intentionally left uncleaned, have been critical to the NOAA monitoring program's ability to determine impacts due to oiling alone and those due to cleanup. During an oil spill, there are compelling reasons to clean up all oil; however, to monitor the recovery of shorelines, set-aside sites are key considerations. We recommend that the concept be discussed during oil spill contingency planning and again during the inevitable spill events. High-pressure, hot-water washing of shorelines, while effective at removing stranded oil, can damage plants and animals in the treated zone directly and indirectly, short-term and long-term. This might seem obvious, but before the Exxon Valdez spill there was almost no real documentation of these impacts. We now know the negative effects of agressive shoreline cleanup methods like high-pressure, hot-water washing. However, this does not mean we would eliminate its use in the future. Hopefully, with the guidance of monitoring efforts like this one, we can employ the method in a wiser fashion. Physical characteristics of the habitat determine the makeup of biological communities. Therefore, altering the physical features of a beach or shoreline can significantly affect the recovery of impacted plants or animals. Physical recovery and stabilization of a site are necessary for biological recovery. For example, when the beach at Eleanor Island (one of our study sites) was cleaned, its silty sediments were noticeably washed out into the water. We believe that many, if not most, of the animals that normally live in this kind of beach require a certain mix of fine-grained sediments. Many would not return until the beach sediments had stabilized. If there is a proverbial silver lining to the Exxon Valdez oil spill, it must include the fact that the incident and its aftermath represented a remarkable opportunity to learn from misfortune. Our research is but one example of the many scientific investigations in Prince William Sound that should help us to understand the environment, how it responds to oil spills and cleanup, and how we can facilitate the process of recovery—however you may choose to define that term. 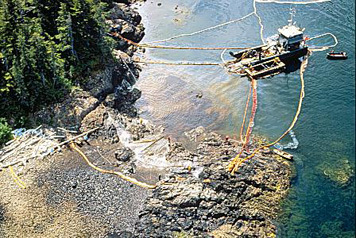 The Legacy of the Exxon Valdez Oil Spill: Learn how the Exxon Valdez spill, while an unfortunate incident, provided a necessary impetus to reexamine the state of oil spill prevention, response, and cleanup. Prince William's Oily Mess: A Tale of Recovery: Read a case study of the Exxon Valdez spill, accompanied by a set of supporting resources, including student and teacher guides, an interactive quiz, an exercise with real data, and an interview with an OR&R scientist. Oil Spill Recovery Institute (OSRI): Established by Congress in response to the Exxon Valdez spill, OSRI works to identify and develop the best available techniques, equipment, and materials for responding to oil spills in the Arctic and sub-Arctic marine environment. Exxon Valdez Oil Spill Trustee Council: This partnership was formed to oversee ecosystem restoration in Prince William Sound. 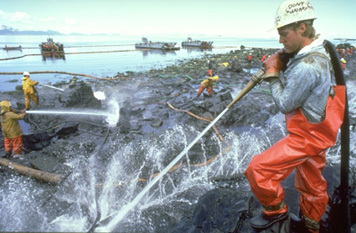 Learn more about the Exxon Valdez spill, its impacts, and restoration and research efforts. Prince William Sound Regional Citizens' Advisory Council: An independent non-profit organization, the Citizens' Advisory Council works to reduce pollution from crude oil transportation through Prince William Sound and the Gulf of Alaska. Go back to the Exxon Valdez oil spill overview page.